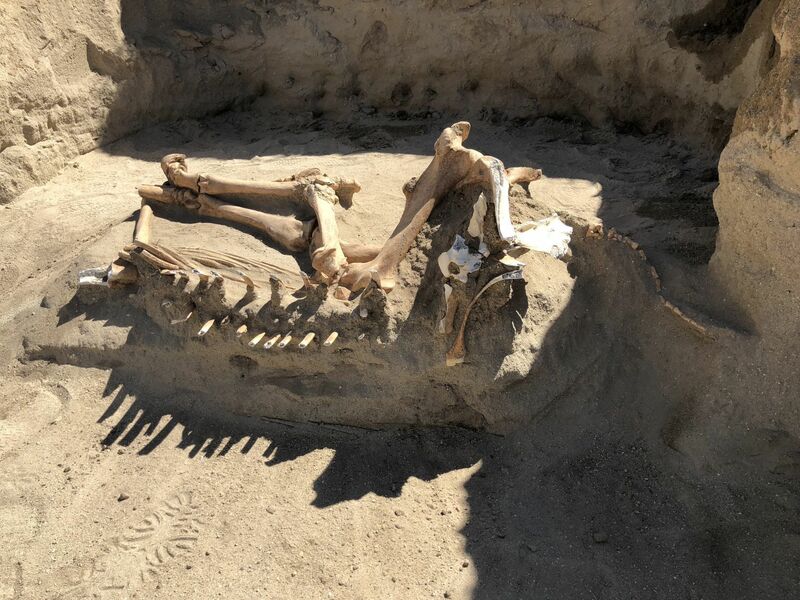 A family in Lehi, Utah, inadvertently unearthed the skeleton of an Ice Age equine while working on landscaping project in their backyard. Laura Hill and her family were prepping the backyard for a new lawn when the backhoe they’d rented revealed animal bones. Hill thought they were historic, maybe the remains of a cow or horse that had belonged to one of the pioneers who settled the Utah Territory in the 19th century. A few months later, Laura Hill visited Lehi’s Thanksgiving Point Museum of Ancient Life and approached museum paleontologist Rick Hunter to tell him about the bones in her yard. Hunter assembled a team of scientists and volunteers to examine and fully excavate the find. They quickly determined that it far predated pioneer Utah. The small horse is 14,000 to 16,000 years old, which means it roamed the area during the Pleistocene Epoch when most of what we know today as the state of Utah was covered by Lake Bonneville. It is therefore rare to find a land mammal like a horse from this period. The Thanksgiving Point team spent Tuesday excavating the bones. The horse — which Hunter described as about the size of a Shetland pony, but built stockier — was mostly a complete skeleton. The horse was laying on its left side with its front legs tucked under and back legs straight out. Hunter also is excited about how much bone he and his team have to work with. The bones have not even mineralized yet, although they are remarkably well-preserved thanks to the sandy soil they’ve been embedded in for thousands of years. Now that they’ve been excavated, they will dry out rapidly which poses a conservation danger. The rate of drying has to be controlled to ensure the bones don’t become brittle. After the bones are fully dry, they will be coated with consolidants that will harden them and preserve them for long-term storage and study. 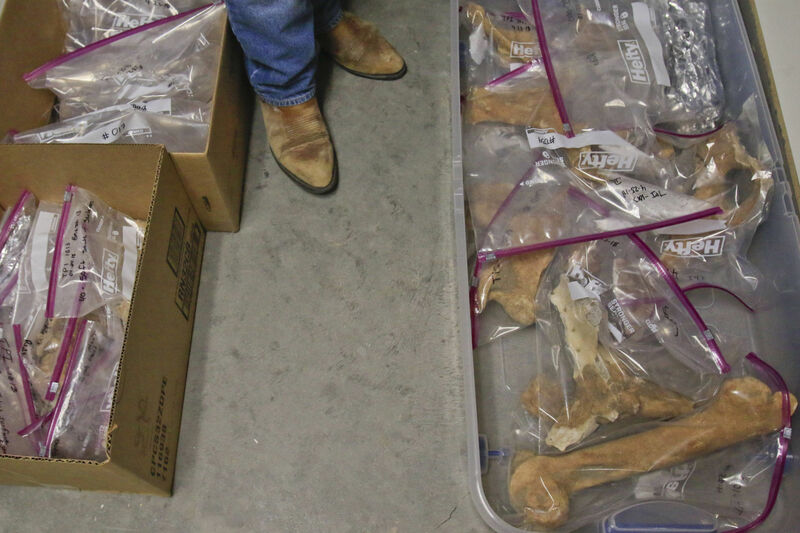 Preliminary osteological examination has already discovered that the horse had arthritis in his back and there is evidence of bone cancer in one ankle. That suggests the animal was of advanced age. 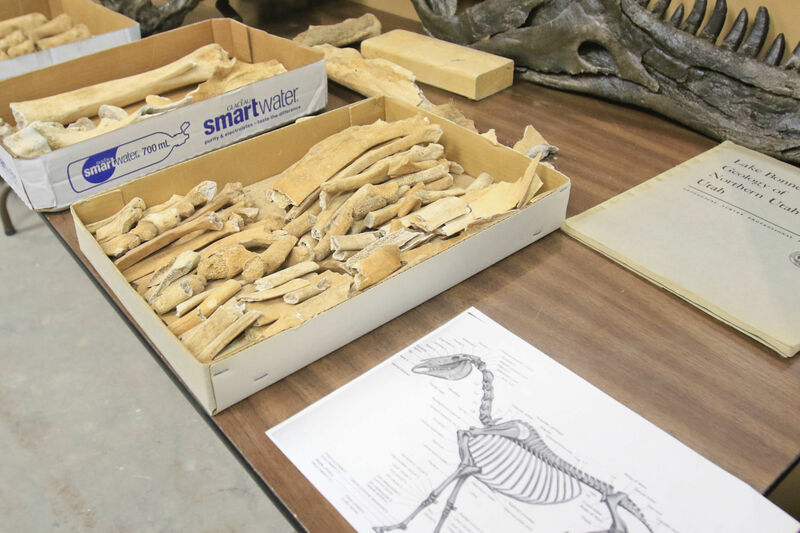 Once the bones are stable and have been thoroughly researched, documented and put back together, the skeleton, dubbed the Hill Horse, will be displayed at the museum. That could take up to a year, but the Hill family is already riding high. Hill’s children and nearby neighborhood kids all got to participate in the archaeological excavation, with Hunter guiding them and teaching them along the way.